Look at these colors and how wonderful they look together. 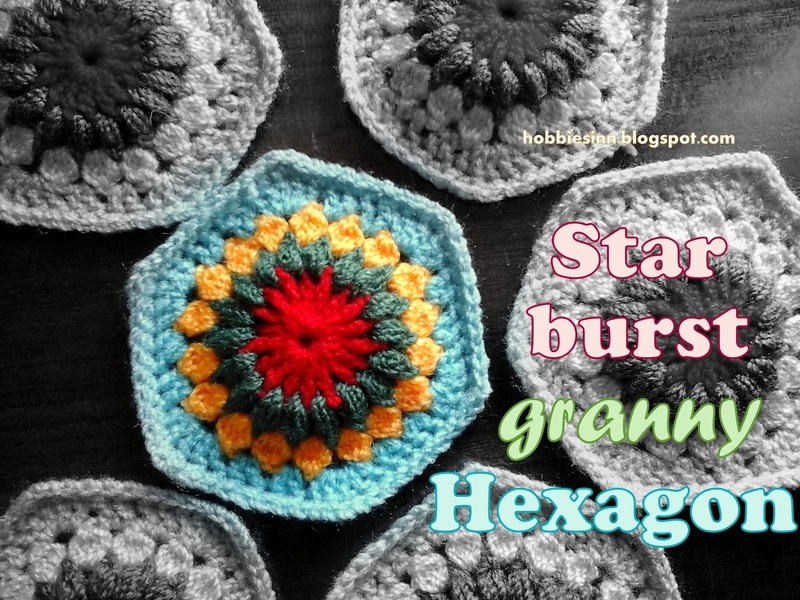 Spring is already here and this hexagon pattern is bringing in extra positive energy. I'm getting overwhelmed with joy that I'm finally able to upload this beautiful pattern. I have a video version of this already uploaded on YouTube. Keep scrolling to get to it. 3 ply cotton yarn in colors Bright Red, Green, Yolk Yellow,and Sky-blue. 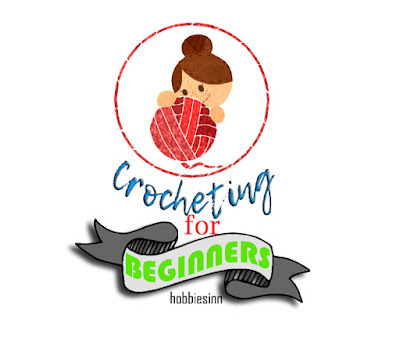 If you are not a crocheter already you can check it out here. Its super easy. 1. Chain 4. Join to make magic ring. Weave in and fasten off the yarn tail. 3. Round 2. (Color-Green)Make a slip knot and join with the red ring just made. Chain 3. Wrap yarn around the hook, insert through the same hole and pull once. Wrap again and pull again. Repeat one more time. [i.e. 3 time in total] You will have 7 loops on the hook. Pull yarn through 6 of them leaving the last one. Now you will be left with 2 loops on the hook. Pull yarn through both of them and chain 1. This stitch is called puffy stitch. Repeat this for each hole. you should have 18 puffs by the end of this round. Fasten off and weave in the ends. 4. Round 3. (Color-Yellow) Make a slip knot and join with the previous round. Chain 3. This round includes only double crochet stitches. Again we will be working in holes rather that stitches. Wrap yarn around the hook, insert through the hole we have joined our yarn with. Work a double crochet stitch but don't complete it. work 2 more double crochets in the same manner, but don't complete any of them. You will have 4 loops from the four double crochet stitches on the hook. Pull yarn through all of them and chain 2. work four double crochet in each of the next holes of this round. Join, fasten off and weave. 5. Round 4. (Color-Blue) Join the blue colored yarn to the previous round. 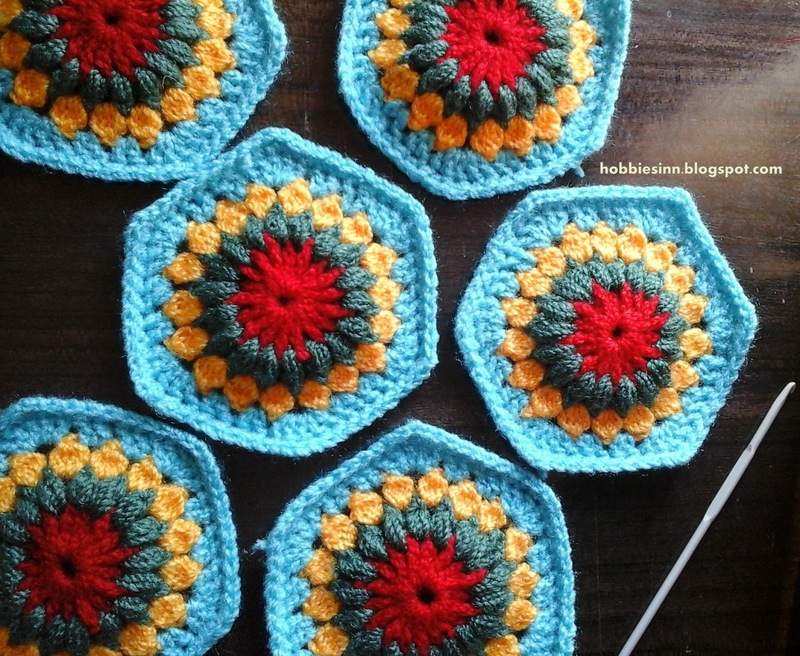 this round is also worked in double crochets. Make 2 complete double crochets in first hole. make 2 more in next. in third hole work 5 double crochets in a single hole. We don't chain in between stitches in this round. The pattern is simple: 2 stitches in one, 2 in next and 5 stitches in 3rd. Repeat for the entire row. By the end of this round we will have 6 edges and 6 vertices. 6. Round 5. (Color-Blue) We don't fasten off and weave but we continue for the last round. In this round we keep on crocheting single crochets in each previous stitch. when we reach the center of each vertex i.e. the 3rd stitch of the vertex, make 3 single crochet stitches in same stitch. this will make the vertex more detailed and will prevent hexagon from curving. You can also watch the video for this tutorial on our YouTube channel. 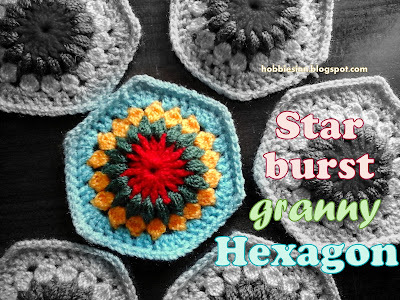 I hope that this tutorial will be helpful to you in your blanket and slipper projects. leave your comments below and let me know what you think about it.